Okay, so you’ve got all the obvious skills as an air talent. But the reason people hire me is that the obvious skills aren’t the ones that actually engage people emotionally. Humphrey Bogart, Sidney Greenstreet, Peter Lorre — all three completely different from each other, all just great vocal studies. Yes, it’s an old black-and-white movie, but it’s a dialogue and acting clinic. Anything with Tom Hanks or Harrison Ford. Hard to beat these two. These guys just embody the “everyman” image, but can also play heroic parts. I’d pay to watch Hanks read a parking ticket. The best mini-series ever on TV, with the great Robert Duvall in one of his two favorite performances ever, and the wonderful Tommy Lee Jones. Yes, the ABBA movie. With Meryl Streep, an acting (and voice acting) class herself, and other standout performances from the entire cast, especially the three male stars. If you sneer at it just because it’s ABBA stuff, well, get over it. If you don’t like the violence or subject matter, okay, but you should watch something with Marlon Brando. He understood better than anybody the power of delivering a line softly, rather than being loud. Anything written by Aaron Sorkin. The West Wing, The Newsroom, The American President (if only we had one like Michael Douglas in this movie), Moneyball, The Social Network, etc. Sorkin is, in my opinion, the best screenwriter on earth. He really gets “emotional investment” (an acting term that I preach all the time). Have fun watching, and LEARN. “Maybe” is a word I don’t like to hear, because by definition, it’s ‘conditional’ in nature. “Maybe you’ve done this…” also carries the flip side (in the listener’s head) of “No, I haven’t.” Click. Disengage. “IF” is the magic word. It activates the imagination, and doesn’t leave room for the doubting side of the coin. “Maybe you’re seven feet tall…” only talks to people who ARE that height. But “If you were seven feet tall…” opens up the mental possibility – and the ‘buy-in’ factor, as a result. Anyway, now you’ve got a couple of new arrows in your quiver to help make you sound more CERTAIN – and dynamic – on the air in a very subtle way. 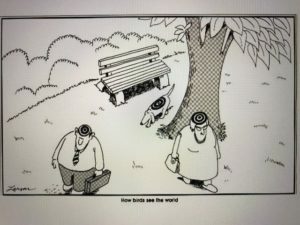 Gary Larson, creator of “The Far Side” cartoon series, is someone I really admire. Do your art, sell fifty million copies of the book “collections” of it, then abruptly retire at 45 years old to reap the benefits of your genius. Well done, Mr. Larson. We treasure you. But what you SHOULD do is value the listener’s time and attention span like a Scuba diver values the air in his tanks. Don’t just read something; put it in your own words. Don’t refer to me in a “collective” way. I’m not “all of you” or “the listeners”. Don’t assume that just because you think something’s interesting or funny, the listener will automatically think that, too. Do keep things brief. Resist the temptation to tie everything up with a neat bow around it at the end. Usually it’s unnecessary. Do promote what needs promoting, but keep in mind that constant “teasing” feels manipulative and sounds cloying. Do aim at the “target Listener”, but don’t rule ANYONE out. Make great radio – every day, in every way you can think of. Okay, today – after we celebrated our freedom with July 4th cookouts, ball games, fireworks, etc. – let’s add one more step: Celebrate Your Quirkiness. I’m not talking about inventing some bit for on-air. I’m talking about using the things that define you – the things that are sort of private. It wasn’t long before Brant started playing his accordion on the air, as part of a contest. Cute, odd, but HIS. ….and then you heard the back door creak shut, Howard walking the 50 steps back down the hallway, the Control Room door closing, we heard a few more steps, then his chair squeaked, then Charlie Van Dyke’s voice said, “This has been ‘Howard Clark looks at the weather’…” Then a station jingle played, and a song started. No forecast. No temperatures “at the airport.” Just that little moment. I still think of these two things, years later. What have you done that’s quirky – that’s really you, and ONLY you – for your listeners to remember? DO SOMETHING. Maybe someone will notice you. You can’t get Arbitron diaries or PPM devices without people.